For the past twenty years Nissan’s Infiniti has been working on perfecting the world’s first variable compression turbocharged engine. At the turn of the last century SAAB was working on their own version of the project before it was put on the back burner. (SAAB had been bought out by General Motors.) It would seem Infiniti has finally cracked the formula! Now, for all of us who don’t have advanced degrees in engineering, let me explain. Basically, the engine is smart enough that it can adjust the piston automatically based on driving style and road conditions. If you need more grunt the piston moves down to a lower compression, a shorter stroke, and forces the turbo to create more boost. When you’re cruising on the highway in top gear the piston moves to its highest point, for a longer stroke, and improve gas mileage. It combines the power of a 2.0-liter turbocharged gasoline engine with the torque and efficiency of an advanced four-cylinder diesel engine. The 2.0 liter turbo gasoline engine can produce the benefits of a turbo diesel without the higher emission levels long associated with diesels. The VC-T can adjust its compression ratios between 8:1 and 14:1. I drove this new engine at the 2018 Texas Auto Round Up, offered in the new-for-2019 Infiniti QX50. On the track you can’t notice the VC-Turbo working in action. However, if you stab the throttle the QX50 jumps off the line, generating a respectable amount of grunt from its relatively small, 2.0 liter displacement. The bigger benefit: on the highway owners are able to get a little over 30 mpg. The photo below, provided by Infiniti, shows how this new technology works. Engineering Explained was able to take a behind the scenes looked at this engine and break down this new technology. On the inside, Infiniti has completely redesigned the interior of their all-new CUV. The top-of-line trim level is called the Autograph, and aims at delivering Audi and BMW levels of luxury. The package costs $2,000, and that’s after spending an additional $8K of added options required for the Autograph. Here is what you get for your money. Two infotainment screens in the center dashboard. The one on top shows navigation, while the bottom works as your control panel. 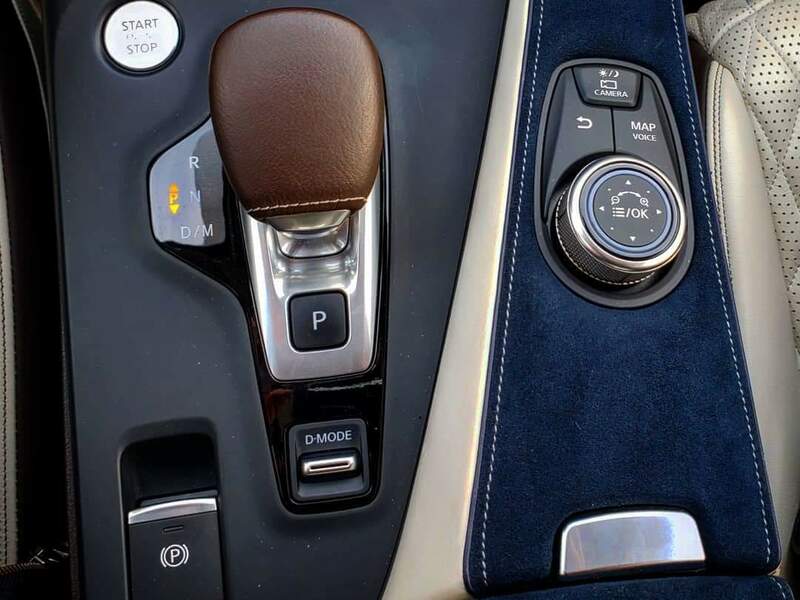 Both are touchscreen, and the most common controls (climate control, audio volume, and radio tuning) are still manual knobs and buttons to keep from being overly complicated while driving. The great thing about this system is the luxury of choices. If you aren’t a big fan of touchscreen you can control the screen options on a rotary controller in the center console. Besides tech, the QX50 Autograph offers one of the most modern interiors I’ve seen to date. It’s rare you see up to four colors in a vehicle’s interior. The QX50 Autograph comes with white semi-aniline leather seats that look as good for the rear passengers as they do for the front. Brown leather covers the dashboard and a blue ultra-suede breaks up the brown and white in a beautiful clash of earth-inspired colors. 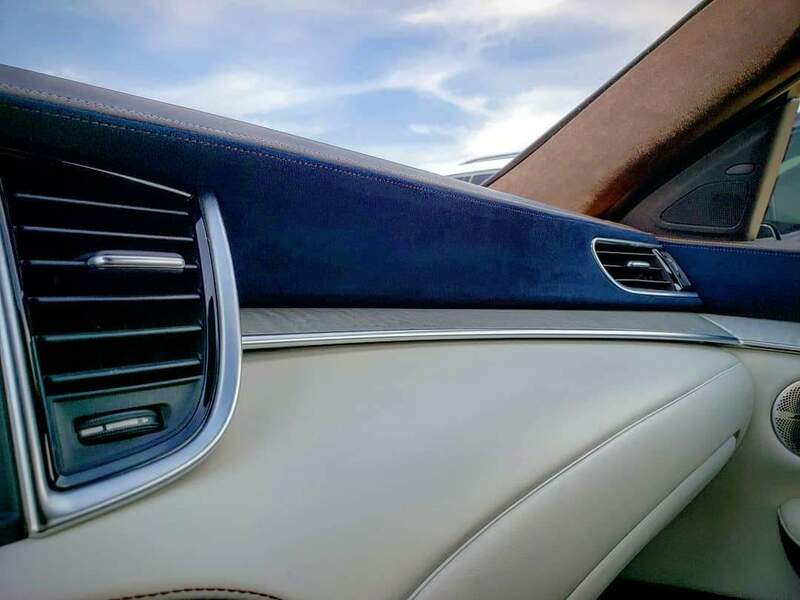 Real maple wood trim and aluminum accent the colors in just the right amount, without feeling overbearing or vulgar. Sitting inside makes you want to take a moment to appreciate your surroundings with both eyes and hands. Everywhere you lay a hand feels like a different texture. I especially like the clean line that goes from the driver side door, across the dashboard, and around the passenger side in one long design. It all works to make the interior feel symmetrical, modern, and crisp, like a new smart phone fresh out of its packaging. Infiniti has been stuck in Lexus’ shadow amongst non-car enthusiasts, aka consumers, since it inception. Just ask anyone on the street and I’ll bet you cold hard cash that most will know Lexus better than Infiniti. But with this new VC-T engine – and new interior designs – it seems that Infiniti is ready to capture the spotlight in America as a premium luxury brand from Japan. Special thanks to Kevin McCauley for credit in capturing the 2019 Infiniti QX50 in motion.